Sunday was a perfect, crisp, Autumn day for flying. 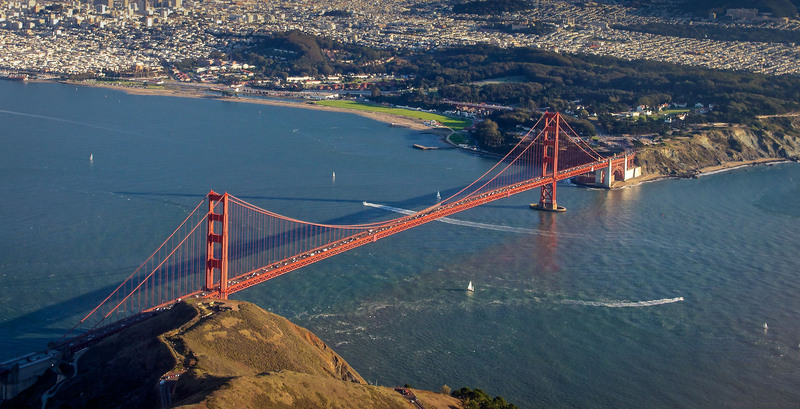 And I had the opportunity to photograph the Golden Gate Bridge from the air with my brother Pat and his friend Wade, who is a pilot. So we took off in a Cessna from Sonoma County Airport, flew down the coast, and circled back at the bridge so I could photograph it. As with my flight over Oktoberfest in Munich, I used the Olympus OM-D body and the Panasonic Vario 12-35mm f/2.8 zoom to photograph the sites below. I kept a polarizer mounted over the lens to improve color and contrast. A rubber lens hood helped me minimize reflections while shooting through glass. This image of the Golden Gate Bridge was recorded at 1/200th at f/5, ISO 400 (keeping in mind that I lose two stops of light with the polarizer.) The bridge is a beautiful site, from land... and sky. Wow, that's a really stunning shot Derrick. Great job!